On Monday night I gave a reading from Madigan Mine at The Wheeler Centre, as part of their “Debut Mondays” series. It’s the first time I’d read that particular section in public, and it’s one of the nastier scenes in the book. There is a knife involved, and quite a bit of blood, and someone getting sliced up (although not fatally). As I was nearing the end of the ten minute reading, I became aware of a commotion in the audience and looked up to see a young man slumping over sideways in his seat. Turns out he’d fainted! Needless to say, I didn’t finish the reading. The young man came around after a couple of minutes and was perfectly fine, if a little embarrassed. During the impromptus intermission, during which some very decent wine was served, three women crowded over to me to ask how the piece ended. “We have to know what happens!” Later, I chatted with a man who confided that he usually didn’t read that kind of thing, but that he found himself completely engrossed by my reading. So, I guess it all went well. You know, apart from making people pass out. Me and Chuck Palahniuk, who knew? 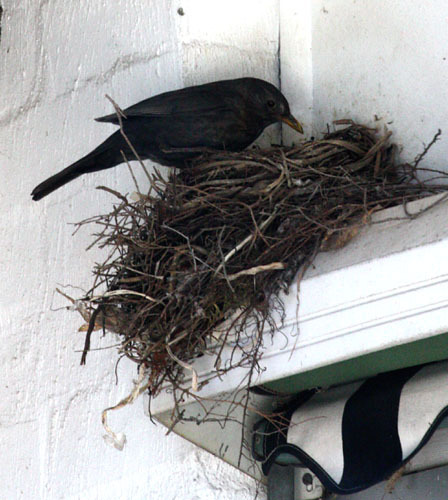 In other news, Mother and Father Blackbird have both been working very hard the last couple of days, flying to and fro with food for the new babies. I can’t see them from my vantage, but I’m thinking of setting up at a ladder at a respectable distance just to have a squizz. 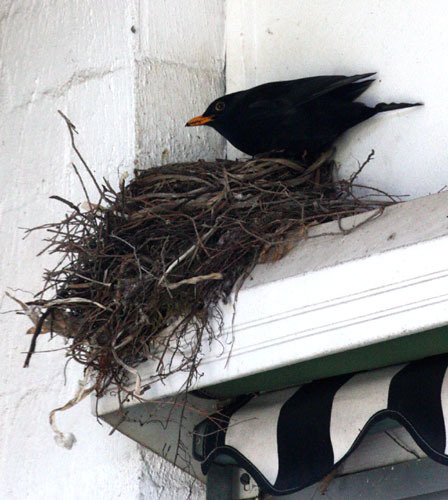 I’ll wait a couple more days until the babies are older and I am perhaps at less risk from being divebombed from a justifiably irate Father Blackbird. Here are a couple of photos of the industrious pair. I do believe that Father Blackbird is giving me the evil eye! I’ve said it before, I’ll say it again: you are my Queen.